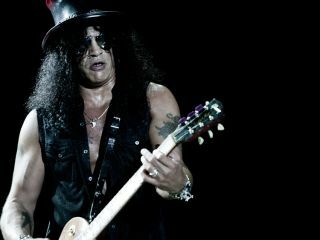 Slash's new song, You're A Lie, doesn't hit radio until next week, but you can check out a teaser of the track above. The cut is from Slash's second album, Apocalyptic Love, which is the first record he's recorded with his live band, now credited as Myles Kennedy & The Conspirators. In the UK, Apocalyptic Love will be released on 21 May in an exclusive Classic Rock Fan Pack form, providing a unique collectable package containing the studio album with bonus tracks alongside a specially created magazine with unseen behind-the-scenes content put together by Classic Rock. For a look at Slash in the studio, check out these new "webisodes" below. To view the first two, click here.